In a hot saute pan or skillet, add the olive oil and distribute around pan. 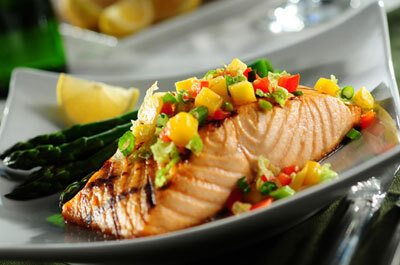 Place salmon fillets in hot pan (skin side up) and sear fish about 2 to 3 minutes. Remove from oven and transfer fish onto a platter (skin side down). Spoon Mango Slaw** over fish and garnish with dry Asian noodles and parsley. Heat sesame seeds in oil over medium heat until brown. Set aside to cool. Combine mango, cabbage, onion, pepper and almonds; toss. For the dressing combine water, vinegar, sugar, soy sauce, fish sauce and seasoning packet from soup mix. Stir until blended. Pour dressing over mango slaw and toss just before serving.